Rugby prides itself on tradition and that healthy respect for the past will be there for all to hear next week amid the fanfare surrounding the start of the World Cup. The man at the centre of proceedings at packed-out Eden Park when the All Blacks tackle Tonga will be Irish referee George Clancy who is set to join an elite club featuring just six other officials. Australian Bob Fordham (1987), Scotsman Jim Fleming (1991), Welshman Derek Bevan (1995), New Zealander Paddy O'Brien (1999), fellow Kiwi Paul Honiss (2003) and Englishman Tony Spreadbury (2007) have all taken charge of a World Cup opener and carried out their duty brandishing two of the game's most treasured mementos. The 'Gil Evans whistle' and the 'Freethy florin' have a long and storied history that is enriched with the passing of each World Cup thanks to the support of the International Rugby Board. 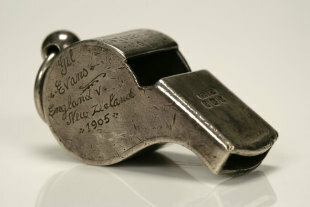 The whistle was originally used by Welsh referee Gil Evans for England's first ever clash with New Zealand at Crystal Palace in 1905. The whistle oversaw a 15-0 victory for 'The Originals' before later being presented to another Welsh referee, Albert Freethy, who used it for the 1924 Olympic Games finale in Paris that saw the United States beat France. And there was further fame awaiting the whistle in 1925 when it was used to send All Black forward Cyril Brownlie off during their 17-11 victory over England at Twickenham sealing his place in history as the first player to be shown a red card. The coin's historical significance also stems from that memorable game. New Zealand supporter Hector Gray came to rescue ahead of the clash when neither Freethy nor captains Jock Richardson or Wavell Wakefield were able to produce a coin for the traditional pre-game toss. Delighted by the role he had played in the fixture, Gray later had the coin embossed with a rose on one side and a fern on the other. Both items have long since been in the possession of the New Zealand Rugby Museum in Palmerston North, having been gifted to the tourist hotspot, and their new lease of life on the World Cup stage came about thanks to the enthusiastic effort of co-founder John Sinclair who was determined to see them used for the inaugural tournament 24 years ago. Fans passing through next Friday hoping to see them should be warned they will be missing from the museum's impressive collection. Tournament organisers have already requested their use and museum director Stephen Berg is delighted to part company with them - albeit temporarily. "I have spoken with Martin Snedden [chief executive of tournament organisers Rugby New Zealand 2011] and with Paddy O'Brien [Head of Referees, International Rugby Board] and had confirmation from them that they want to use them," he explained. "We have arranged transport for the whistle and coin to get up to Auckland in a few days and they will be there for that opening game and I understand from Keith Lawrence [referee manager for the tournament] and Paddy that George is pretty thrilled about getting the first game and getting to use the whistle and coin. "As a referee, the highlight of your career must surely be refereeing at a World Cup and to be able to take charge of the opening game with the whistle and coin that has previously been used by all these fantastic referees must be the ultimate." Berg's respect for the items is understandable but their significance in the history of the game is underlined by letters from those referees who have been lucky enough to use them. The last official to have that honour was Spreadbury, who took charge of France's clash with Argentina four years ago and later marked the occasion with a three-page heartfelt letter recalling the experience. "This wonderful ritual of using an old Florin that had been first 'flipped' at Twickenham in 1925," he wrote. "However, even in the highly charged atmosphere of a World Cup a smile broke out from the captains of both teams, Raphael Ibanez and Agustin Pichot, as one of them had to select the rose! "...Then at 9pm at the Stade de France in front of 80,000 people and with a TV audience of millions, I gave a huge blast on the whistle and the 2007 Rugby World Cup, the Webb Ellis Cup, was underway. I have to admit to being somewhat superstitious. I therefore passed the whistle, for safe keeping, to Stuart Dickinson, the touch judge, at the first lineout and continued with my 'Acme Thunderer' which I have used for some 30 years. "...Thank you very much indeed for allowing me to participate in and continue a piece of rugby history." Berg is rightfully proud of the role the whistle and coin play in the tournament and is already hoping that they may be used for yet another historic milestone. "They are totally unique and wonderful items and it is such a great thrill to have them 'living' and carrying on their life, their journey, " he explained, "and with 7s set to be included in the Olympics we are wondering whether we should breathe life into them again in 2016."